If you were a teenager in the late 80s and early 90s there is no doubt that NWA was a part of your life in some form. You may have loved them, you may have hated them, but you definitely knew about them...and about Compton. This film comes at a very interesting time in America where we are seeing cries of police brutality across the nation. 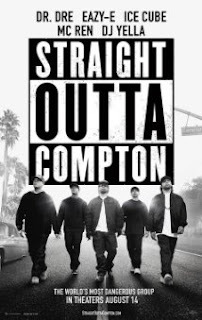 As you watch the movie it almost feels like the words of Ice Cube and MC Ren were 25 years ahead of their time. (Either that, or we've been ignoring a real issue for a very long time). This film clocks in at almost 2 1/2 hours, but it moves fast. The drama is real, intense and non-stop. It also has a light-hearted side that is a nice relief from the depths of darkness in which we find the characters. It also has a lot of the music from that era, but it feels like it's not quite enough. 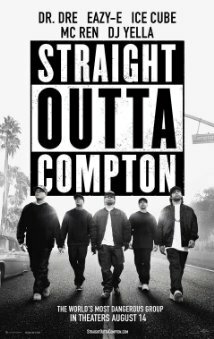 The film is produced by Ice Cube, Dr. Dre, and Tomica Woods-Wright (the wife of Eazy E), and they all have said that they wanted this movie to be as close to the real thing as possible. I'm sure there are some embellishments and moments of convenience, but for the most part, it feels very authentic. The only major player not associated with the film is NWA's former manager Jerry Heller. He's said a few things about the film not relaying the truth, but time will tell if he thinks it is enough off base for a lawsuit. The acting and casting are also stellar. Ice Cube's son plays his father in the film and the other actors are so spot on you actually feel like you are watching a reincarnation of the group. This film has a better than average chance of being a contender during awards season. It is well worth spending the money to see it on the big screen. Plot: US and Russian spies must work together to stop a mad man from getting a nuclear weapon. If you are a tried and true fan of the James Bond franchise save your money for SPECTRE. This is not James Bond. It's not bad at all, in fact there is a lot about it that is quite enjoyable. It just has a completely different feel than you would expect from a typical spy flick. That probably has a lot to do with it being written, produced, and directed by Guy Ritchie. I am always wary of a film that has one person in charge of so much. Especially if that person is one that is incapable of hearing the word "no" from his employees. (See: MacFarlane, Seth). But Ritchie actually made a movie worth seeing. 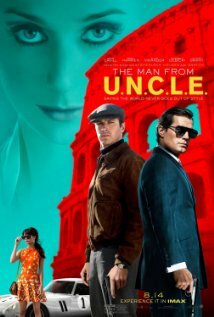 I wouldn't pay full price to see this flick simply because Henry Cavill's speech pattern is insufferably annoying and Armie Hammer's Russian accent is passable at best. Unfortunately, the two of them talk throughout the whole film. I will say that the plot is interesting and suspenseful, there is a lot of great action and the laughs are plenty. You won't be disappointed seeing this film in theaters, but it's not going to be a long-lasting fan favorite. Labels: Alicia Vikander, Armie Hammer, Corey Hawkins, Henry Cavill, Jason Mitchell, Movie Review, O'Shea Jackson Jr., Paul Giamatti, Straight Outta Compton, The Man From U.N.C.L.E.